Android based smartphones are growing at faster speed because of their availability at reasonable cost. Android phones compete with desktop and laptops in many aspect including apps, Entertainment, Internet etc. Smartphones are best portable device for internet access, video calling, audio and video playing and much more. Main reason behind the popularity of android devices is variety of apps and games. So i recommend you to must check best android games. Android device can perform various multiple task. Music become a part of entertainment. People like to listen music. smartphone are widely used for playing audio songs. For playing songs we need music players. 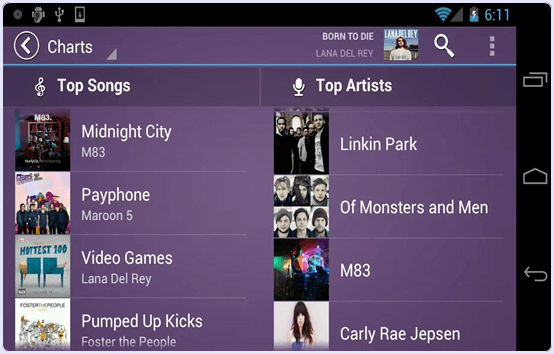 Also android mobile provide you default music players. But to add more functionality to music playing we need music player for android. With the help of these music players we can download song from web, share song with our friends, set a song as ringtone, forward and rewind songs, generate playlist, add different effects to sound, suppress noise effects etc. There is a variety of Android music players available on Google play store some of which are free and some are paid. If you do have any best android music player then do not worry because we here provide you list of some best music player for android. Few are paid and rest other are free to use. Try and choose according to your requirement. List Of Best Music Player For Android. 2. Poweramp Music Player (Paid). 8. n7 player Music Player. Google play music is one of the best music player available on Google play store for free. We can add up to 50000 music files from our own music collection. We can also download music of our choice from Web. Users can also buy new music from Google play store. We can also create our custom radio from our collection. We can access our music without syncing our device. It is available for all android version. Approximately 50 million+ users install this player. 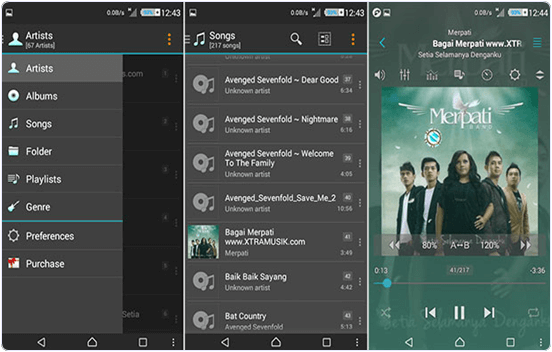 Poweramp Music player is another music player for android which is available on Google play store for free. It support all music formats like MP3, WAV, OGG , Mp4 etc. Poweramp provide headset support, automatic headset resume, Bluetooth connection support etc. It provide you a trial of 15 days. After 15 days you have to buy it using buy button inside the player. 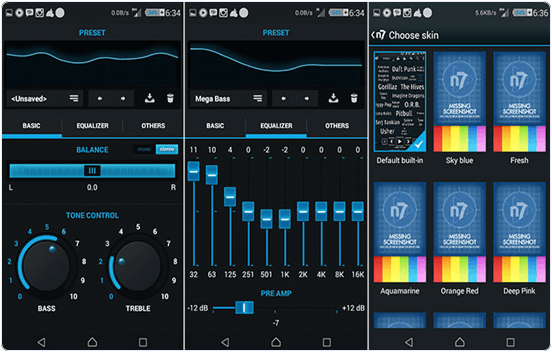 It is compatible with all Android version.We can also set the separate bass and trouble effects. MP3 player is another popular Android music player. It provide easy to use and attractive interface. It support all the sound formats like MP3, Wav, OGG, AAC, OTA etc. We can built our custom list to listen our favorite songs forever and add,remove songs from our list. It also provide you the build in MP3 cutter for making ringtones. This player has five band equalizer. It also allow music search from internet. It also provide option to play music album and artist vice. 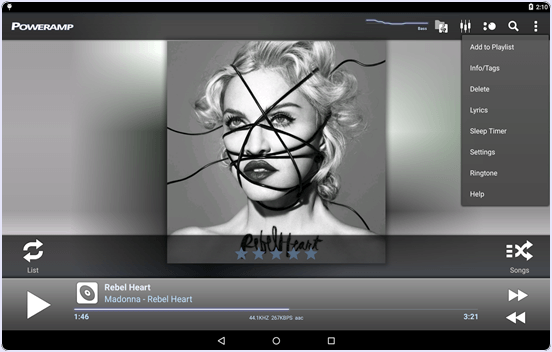 Fusion Music Player is another popular music player for android. It provide instant access to online music and also provide option to search online music. Fusion is compatible with all Android version. It support all audio formats. It also provide inbuilt MP3 cutter. Fusion also provide integration with YouTube. We can also share the song which we are listening via Facebook and twitter. It also provide Bluetooth and headset support. Approximately 500000 users install this players. 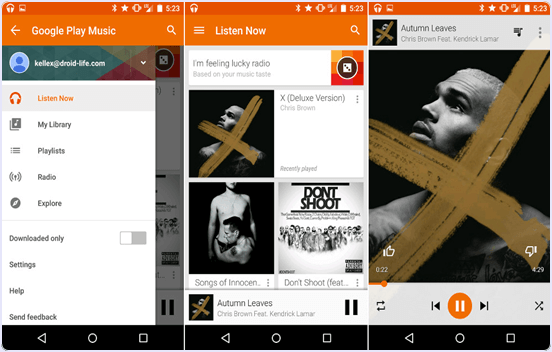 Laya Music player is another widely used Music player for android which is available on Google play store for free. This player provides instant access to your music collection in Android device. We can browse and play music by Artist, Album, genres. It support AAC, AMR, FLAC, MIDI, MP3 etc. It provide five band equalizer. This player also support additional sound effects like bass, echo, trouble beet etc. It provide support for headset. 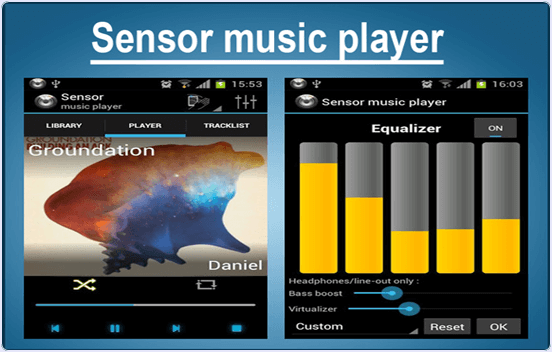 Sensor Music player is another Android music player. It is freely available on google play store. The player is divided into three tabs. First is library tab to browse our music collection, second is player to control the music playing and add it to various sound effects, control. Third is track list to track the playlist of songs. It provide simple and easy to use interface. It provide smart search bar for music search and download music. 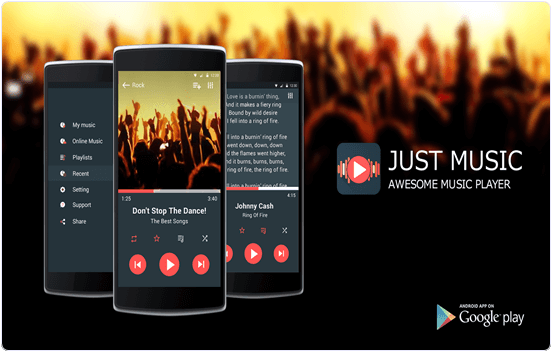 Real Music Player is one of widely used Android music player which is available on Google play store for free. It provide you features including Headset, blue-tooth, auto generate playlist, edit playlist, support for music search. We can also add customize skins to player. It also provide social media support for sharing music listening status. 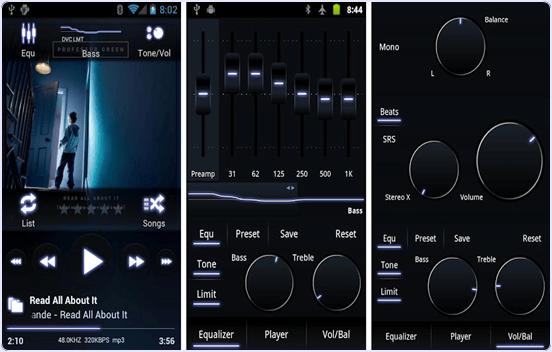 n7 player Music Player is one of the best high rated app in the list of music player for Android. It has a rating of 4.5 on Google Play store. It has rather a beautiful interface and attractive graphics. 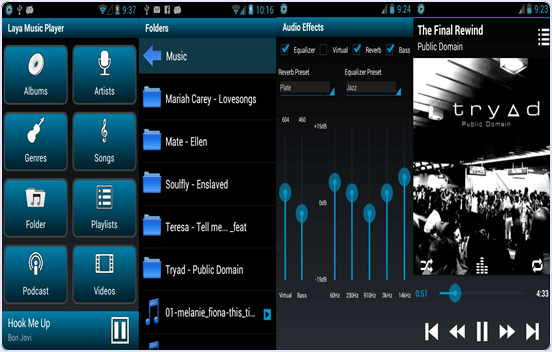 The n7 player Music Player support all the common music formats. It has full features 10 band equalizer which provide high quality music. 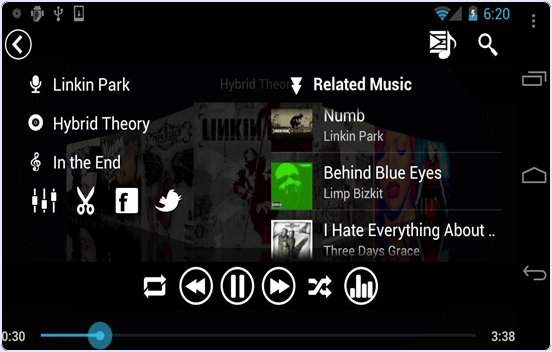 The n7 player Music Player also provide playback feature. It also provide easy browsing of our music libraries with searching filters. Approximately 50 million user download this app. It is also a good music player for Android. Jet audio is rather a combination of music player and equalizer. It support all the music format. We can easily speed up from 50 to 200 percent. It provide 14 different size of widgets. It provide two lock screen and light grey browsing background for our music library. Approximately 10 million user download this app. It is yet another best high rated music player for Android. It provide high quality sound quality. We can also easily listen music while using our favorite app and on lock screen widgets. It also provide customize skins and backgrounds. Just Music Player also provide online Walkman. It also provide equalizer control. Approximately 5 million user download this App. Hence, these some best music player for android device. We have listed few paid and free music players. In you have any of the best and popular android music player then share it in the comments.